In order to remove a contact or a group of contacts from your list go to Contacts>>Search contacts in the dashboard and display your list (click here to read the FAQ on searching contacts). 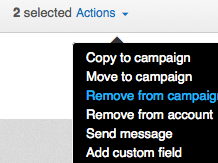 Select the contact(s) you want to delete and click Remove from campaign or Remove from account under Actions. To delete multiple addresses at the same time check the boxes beside contacts and delete them by selecting the removal action from the Actions list at the bottom of the page. All removed contacts can be found in the Removed section which is available in the list of contacts (top right corner). You can also remove contacts in Contacts>>List hygiene>>Add emails. There paste the email addresses to the box and choose Unsubscribe from.